The current situation in Bahrain is dire, causing great concern to the Gulf Centre for Human Rights (GCHR), and partners, as well as United Nations experts; yet there is little action on the part of allies. As Bahrain heads towards elections in November 2018 (postponed from October), the government seems determined to keep a tight lid on independent civil society, allowing no real dissent or opposition, having closed down opposition societies and jailed some of their leaders. 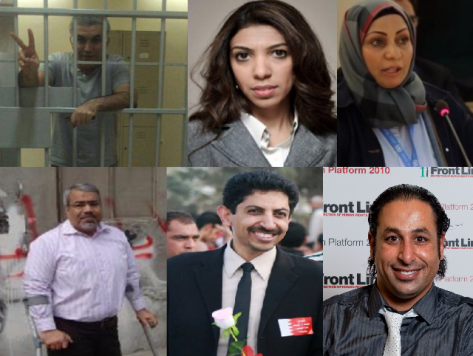 In addition, the country’s leading human rights defenders Nabeel Rajab and Abdulhadi Al-Khawaja (GCHR’s Founding Directors) remain in jail. Following an inquiry into the February 2011 crackdown, the government pledged reforms in a report to the King, and through its obligations under the United Nations’ Universal Periodic Review (UPR), yet violations persist and UN experts have been prevented from visiting for the past five years. Other UN bodies and representatives, as well as the European Parliament have also taken note of the suffering of Bahraini human rights defenders with EP members of parliament commenting on their trials. Rajab is a finalist for the Václav Havel Human Rights Prize, and is invited to the awards ceremony at the Parliamentary Assembly of the Council of Europe (PACE) on 08 October – which he won’t be able to attend if he is not released from prison. Among other recommendations, GCHR calls on the Bahrain government to uphold its commitments made through the UPR; and immediately and unconditionally free Al-Khawaja, Rajab, Dr. Abduljalil Al-Singace, Naji Fateel and all other human rights defenders from prison. Please join GCHR and partners for a side event on Bahrain which will take place during the 39th session of the HRC on 12 September 2018, at 10-11am in room XXIV, Palais des Nations, in Geneva. Read the full report, available in English, here.